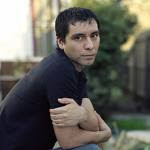 Manuel Muñoz is the author of a short-story collection, Zigzagger, published by Northwestern University Press in 2003. He is the recipient of a Constance Saltonstall Foundation Individual Artist's Grant in Fiction and his work has appeared in many journals, including Swink, Epoch, Glimmer Train, and Boston Review, and has aired on National Public Radio's Selected Shorts. A native of Dinuba, California, Muñoz graduated from Harvard University and received his MFA in Creative Writing from Cornell University. He now lives in New York City, where he is at work on a novel. Muñoz kindly agreed to answer a few questions for La Bloga. DANIEL OLIVAS: The ten connected stories in your new collection arise from the unforgiving heat of the Central Valley in California where, as you note, people struggle to find meaning “among the houses either crumbling down at the foundation or boasting a fresh coat of paint.” How would you describe the manner by which the environment shapes your characters’ identities and actions? MANUEL MUÑOZ: The Valley is special to me—the more I write about it, the more I become dedicated to keeping my fiction set there. It’s a place that doesn’t appear with much frequency in American fiction, even in Chicano/a letters: I always feel I’m reading about Los Angeles or Tejas. Geographically, the Valley lends itself to the notion of walls, being bordered on all sides, being entrapped. It stands as a physical barrier to movement. And I love its paradox: when I was growing up, Los Angeles was the dream destination. Crazy, no? Wanting to leave a place of such fertility and green for puro concrete? That’s all I need sometimes to keep me writing, the endless well of paradox, of metaphor. The Valley does that for me. OLIVAS: Why did you decide to connect your stories rather than write a novel? MUÑOZ: I began this collection in September 2002, still a while before Zigzagger had been accepted for publication. 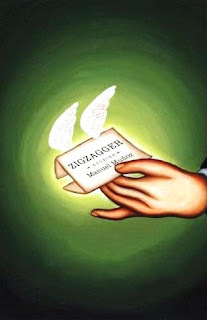 Many small presses had turned Zigzagger down, most with weak-kneed reasoning about reader reluctance to Latino fiction, to gay characters, to the short story form, and so forth. But I knew I had a good book on my hands and an eve r-deepening faith in the short story. So I kept writing stories, intent on starting a whole new book. To keep myself on task, I started riffing on a mere mention of three triplets on Gold Street in “Loco” from the first book. Three stories right there, I told myself—and that’s where the imagination took over, the clarification of this neighborhood and how it functions, a notion of surveillance, how people watch each other. It never occurred to me that it could become a novel or that it should. I was more interested in the special arcs of the individual stories. A novel would’ve demanded something over all of them at one time and I would’ve had to sacrifice each story’s individual nuance to accomplish that. OLIVAS: One of the very fine aspects of your stories is your ability to create characters from all walks of life: male and female, middle class and indigent, gay and straight, parents and children. How do you go about shaping characters who are different from you? MUÑOZ: Again, back to Zigzagger. After the ups-and-downs of its road to publication, I began to believe the many editors who told me that our community wouldn’t be ready for fiction with so many gay characters as focal points. When the book pubbed, I waited for the queer lit community to chime in with some reviews—blog, print…algo. But they were very quiet. I rarely saw my book on their shelves and it was disheartening. Instead, it was the very Chicano/a community that was allegedly unprepared for this content who rose to the occasion. I’m still taken aback by the speed in which Zigzagger has landed on college syllabi, how this community has not pigeonholed the book into any kind of category. 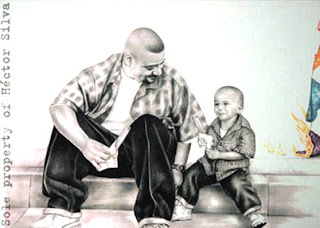 I feel proud about the fact that the Chicano/a community treats me like a writer—no adjective needed. I go in to college classrooms and get questions about structure, narrative line, character development: there’s a tremendous amount of respect underneath those questions, the unspoken assertion that you’re a writer first and foremost. 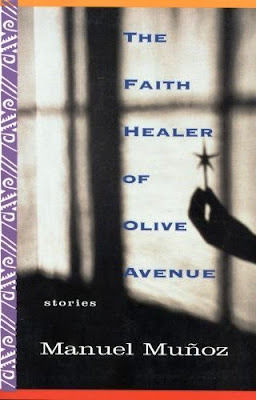 That feeling began to cement itself very much as I progressed with The Faith Healer of Olive Avenue: when you have a community that has faith in your ability in a story, you want to take risks. I began to see the tremendous value in looking at my concerns through various lenses, to challenge myself with points of view and to truly treat these characters like real people. I saw myself broaden as a writer by doing so. I thank the Chicano/a community’s response to my first book from promoting that growth, for taking the time to read me and ask questions: I wish I could have received it from the queer community, too, pero ni modo. OLIVAS: In the story “The Comeuppance of Lupe Rivera,” a young man named Sergio tells us about his glamorous neighbor, Lupe, who has an unending string of handsome suitors cruising by her home or taking her out on dates. Eventually, violence invades Lupe’s life. Sergio, rather than blaming her, tries to make sense out of it: “We all make mistakes—bad luck can ruin everything, even for someone beautiful like Lupe.” Does this reflect your philosophy or is it merely one character’s attempt at understanding what has happened? MUÑOZ: It’s definitely a little of both. Coming from a place mired in poverty and violence, I still try to make sense of why these conditions are so persistent in my community. During my recent visit to the Valley with Helena María Viramontes, we spoke to a longtime friend of hers, originally from East LA, who is still dumbfounded by the Valley’s general condition as a place to live and work. Did we know, she asked us, that Tulare County was the eighth poorest in the entire country? Growing up in a place like this, I always questioned the fairness of it all, even on a spiritual level. I felt like I lived in a place completely ignored by God (which is one reason why I carry very little religious faith). So much hinged on the whims of nature—a cold snap, a hailstorm, a drought—and suddenly people were out of work and hungry. Growing up like that, you start to look for reasons, however farfetched, and begin to readily accept whatever sounds like the best fit. Sergio, in this story, mirrors that impulse in me—that urge to make sense of the world by shaping a story, even if it’s a lie, until you think the edges have rubbed away. OLIVAS: One of the most moving and disturbing stories in your collection is “When You Come Into Your Kingdom.” In that story, a father struggles with a family tragedy that grows out of his disappointment with his son. Other stories deal with parental disapproval with their children. What is it about this parent-child relationship that intrigues you as a writer? MUÑOZ: Ay! I find it so intriguing to have readers point out my compulsions. It really didn’t occur to me that I was doing this, focused as I was mostly on a story-to-story basis. But you’re right. I suppose I find this relationship so puzzling because of its tremendous incongruities and complications. Take my stepfather, for exampl e: he married my mother when I was four or five—I hardly remember because he was always around. But that should tell you something. Here was a man from Mexico, barely surviving on his own with fieldwork, who took on the shared responsibility of five children who were not his. And he did it! Can you imagine? What is this about: Love? Honor? Compassion? How do I explain my brothers’ initial resistance to him in those early years in the face of this sacrifice? Do you see what I mean by the rich texture of possibility? And that’s just my real life! Tambien, I have to say that, as a gay man, the likelihood of ever having children of my own produces an immense longing. It’s a measure of privilege for gay men to adopt or to arrange a surrogate. Here again is the power of the imagination, the breaking apart of the myth of what you wish for: parenting, of course, has to be tremendously difficult, and in my personal longings (like heartbreaks), my way out of that sadness is to build a story around my conclusions, to make something out of my concern and my tristeza that has nothing to do with the initial longing and everything to do with story. That’s how and why stories—I think—hit us so hard. We recognize in the ones that touch us the very things that keep us up at night. OLIVAS: Now that you have two books under your belt, what kind of advice would you offer beginning writers? Any special words for Latino/a writers? MUÑOZ: Be patient. I know it’s hard to hear, and I was certainly guilty of throwing up my hands in disgust. But we must practice patience. The publishing world isn’t ready to give one of us the whole 25-year-old-wunderkind treatment. Keep our predecessors in mind on those days you get fed up: they had more painful rejections and closed doors than we ever will. Keep writing and make sure you send out only your best work. We are under intense scrutiny now in an ever-tightening market for literature: it isn’t enough anymore to rise from a reading inspired to “tell our stories.” Now we have to exhibit craft, too, to show that we’ve got the literary tools to throw some chingadazos if we have to. It may be 2007, but there are more people out there who think Latinos are at a literary event to take coats or serve drinks (believe me—it happened at a journal launch party to me last year). Buy books (and not used ones, por favor—I work in publishing and can’t tell you how many times I’ve heard that Latinos don’t buy books!) And you must read voraciously. You can spot a writer who doesn’t read by the quality of the sentences. OLIVAS: How did you find your agent, Stuart Bernstein? MUÑOZ: I met Stuart on Helena’s urging. I had actually ignored her advice for several months, having already gone with an agent who ended up doing nothing with my work, but she kept insisting that I at least meet with him. Helena knew of Stuart through Susan Bergholz, the mera mera of agents. Like her, Stuart is proving to be a great champion for our writers and a surprisingly savvy reader. I say surprising because I came up believing that agents serve only the function of mediator between writer and publisher. I’m learning that isn’t the case at all. A book, in Stuart’s eyes, is never over once it’s published. He does quite a bit to keep putting books in front of people. More than anything, I’ve learned a new respect for the power of my rights as a writer, especially in this age of digital publishing and the desmadre with Google’s attempt to overreach on copyright laws. I’m grateful to have someone in my corner who is patient enough to explain what it all means and has the facility to negotiate terms if need be. For all the work we do as writers, we get very little financial gain from it, and we cannot allow ourselves to be seen simply as “content providers.” Por favor! You create the work, whether written or spoken or commissioned for an anthology: why should you give it away to someone else? OLIVAS: What are you reading these days? Any books to recommend? MUÑOZ: So far, it’s been a great year for us in Chicano/a and Latino/a fiction. I just finished Alex Espinoza’s superb first novel Still Water Saints and have others waiting: Daniel Alarcón’s Lost City Radio, James Cañon’s Tales from the Town of Widows, Blas Falconer’s poetry collection A Question of Gravity and Light (because I’m a big poetry reader, you know) and tambien the forthcoming bigshots, Ana Castillo’s The Guardians and Junot Díaz’s The Brief Wondrous Life of Oscar Wao. I’m very anxious to begin dialogues with other writers about Helena’s Their Dogs Came with Them. Move it up to the top of your piles, please! Her novel is a well of innovation, structural composition, and drive—a perfect marriage of story and craft, made deeper, of course, by Helena’s commitment to social justice. But I don’t have anyone to talk to about it yet, so hurry up already. Next up for me is William Henry Lewis’s short story collection, I Got Somebody in Staunton (ay, what a great title!). I have a great interest in African-American fiction because it serves as a strong guidepost for our literary community. If you haven’t already, take a look at their work from the 1970s, anything from Toni Cade Bambara to Gayl Jones to John Edgar Wideman: you’ll marvel at the riches, the huge leaps of faith they exhibit in their storytelling. We have much to learn from their community and their output: you need only look at the current crop of superb young African-American poets like Tracy K. Smith and Kevin Young and Terrance Hayes to see what happens when your predecessors lay out good, solid literature before you like breadcrumbs in the forest. You know exactly where to go next. Other than that, I always recommend John Edgar Wideman’s Philadelphia Fire, Joanna Scott’s Arrogance, Mary Gaitskill’s Veronica, J. M. Coe tzee’s Disgrace, Ian McEwan’s Atonement, Joan Silber’s Ideas of Heaven, Joyce Carol Oates’s big-bad Blonde, and any of Edward P. Jones’s work, but my favorite is his standout first collection, Lost in the City. Stop me already: I could go on and on. OLIVAS: What are you currently working on? MUÑOZ: I’m currently writing a novel. It’s about a young woman who auditions to sing country songs in a Bakersfield cantina circa 1959 and falls in love. Like all aspiring artists in literature, she’s ill-fated and doomed. Pobrecita. That’s all I’ll say for now. OLIVAS: Who are your mentors? Are you acting as a mentor to new writers? MUÑOZ: I’ve talked Helena to the high heavens at this point. I’ve been on tour with her in California since Faith Healer pubbed a few weeks ago and I’m still in awe at how students approach her with such reverence and respect. There are all sorts of reasons for it, of course, but it’s really her warmth, her commitment, the way her voice quivers with passion when she gets that pointed question about why writing matters at all. She’s a phenomenal inspiration and I’m so lucky to be riding her coattails right now. I feel very proud about putting on a good reading while she’s watching, because I know it reflects on her as a maestra, the totality of her presence and influence on our literature. I don’t think I had any real idea about it until I saw the lines of students coming to her with nothing but thanks. So I’ve upped my game, believe me. I don’t act as a mentor to other writers, mostly because I don’t teach. I have a nine-to-five copyediting/proofreading job in publishing and hardly ever meet students. I gladly read others’ work if approached, but I’m never sure if my readings for them are ever helpful. It can very difficult for me to try to balance being a writer outside of the academy frankly. Around this time of year, I become very jealous of my friends who’ve worked hard for nine months and now have the summer off to concentrate. I know they’re tired, but my work is endless, and the mental strain of reading all day, only to face the desk at night, can be daunting. WHEN: Monday, June 4th at 6:00 p.m.
WHAT: Fundraiser for La Gente de Aztlán UCLA’s Chican@ Latin@ newspaper. WHO: Expecting 300 guests including artists Gronk, Salomón Huerta, Ernesto Vazquez (EVILL), Hector Silva, Miguel Angel Reyes, Douglas Miles (apache skateboard), Jose Cabrera (Crying Macho Man), Victoria Delgadillo, Javier Hernandez (El Muerto), Sandra de La Loza, Gilbert "Magu" Lujan, Nuke, William Acedo, La Gente Staff, Al-talib newsmagazine, Pacific-Ties newsmagazine, Nommo newsmagazine. Kerckhoff Hall Art Gallery is located next to Ackerman Student Union; Lot 6 is the closest parking lot to Kerckhoff. Cross streets Strathmore Avenue and Westwood Boulevard. For more information about La Gente de Aztlán, UCLA Newsmagazines, and programs, visit www.myspace.com/lagente_newsmagazine or call 310.825.9836. ◙ If you missed yesterday’s excellent report from the National Latino Writers’ Conference by our guest correspondent, Andrea Sáenz, you may read it now. Thank you, Andrea! ◙ In yesterday’s El Paso Times, Rigoberto González reviewed Felicia Luna Lemus’ new novel, Like Son (Akashic Books, $14.95 paperback). He says, in part: “A writer with an unparalleled literary style and attitude, Felicia Luna Lemus comes charging full force with her second novel . . . a page-turning account of ‘a most unusual trinity’ of characters navigating through the most universal of themes: love and heartache.” I note that Akashic Books is one of the best independent presses around. I just reviewed one of its newest anthologies, Los Angeles Noir, edited by Denise Hamilton. ◙ If you missed my post of last week regarding the disgraceful manner by which longtime columnist, Al Martinez, was forced out of the L.A. Times, you can read it now and send in an email to the Times to voice your disappointment. Also, you can read Martinez's column in today's Times for Memorial Day. Another great post, Daniel. Your work--tireless, generous--continues to spread our words. I continued to be humbled and made hungry to be a better Bloga contributor by reading once again, a thoughtful, trenchant interview that cuts to the heart of a writer's life, his identity, and work. This piece makes Munoz as a gay hermano, an integral part of our literary community and the comunidad at large, visible and real. You continue to put out a range of creative endeavors across the board as a touchstone. Well, God bless both of you but I'm the lucky one being part of La Bloga. Review: Frances Hwang. Transparency. Stories. Do Chicanas Read/Write Mystery Fiction? Do You?